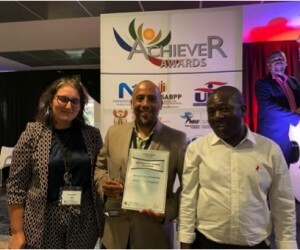 The Local Government Sector Education and Training Authority (LGSETA) nominated the Stellenbosch School of Public Leadership (SPL) in the category for the best innovative training programme award. 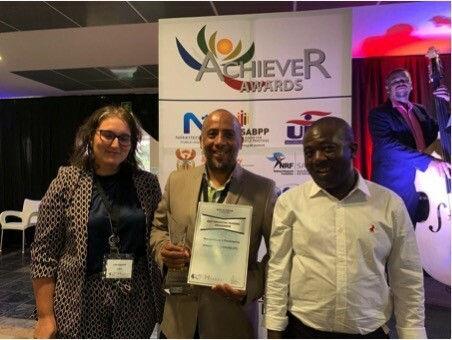 It was a great honour for both the LGSETA and the SPL to attend the Achievers Award ceremony, which formed part of the National Skills Summit, held at the Council for Scientific Industrial Research (CSIR) in Pretoria on the 12 March 2019. The award for the most innovative training programme was received by Dr Harlan Cloete on behalf of the SPL. The acknowledgement of this award for best skills programme, “Human Resource Development for Good Municipal Governance” represents a great achievement not only for the SPL but also for the LGSETA. The Acting CEO of the LGSETA, Ms Nonhle Mashinini, praised the SPL by stating, “we want to thank SPL for giving the best that the country deserves, we are proud to be associated with you”. The recommendations of the research led to the development of a three-day skills programme titled ‘Human Resource Development (HRD) for Good Municipal Governance’. The first phase of the training was aimed at capacitating Skills Development Facilitators (SDFs) and in 2018 a total of 341 SDFs from municipalities were trained across the nine provinces. This training was extremely well received by participants. In 2019, as part of the continuing strategy of LGSETA strategy in order to build capacity on HRD issues in and across municipalities, the training programme was revised to a four-days and extended to Human Resource Management Officials and members of the Local Labour forum, more specifically members of the Training Committee. 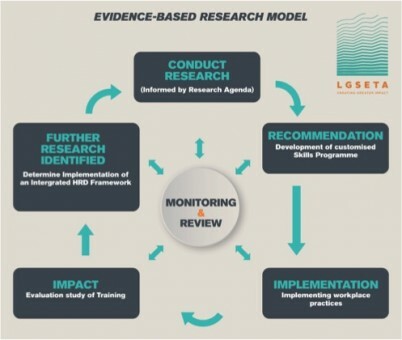 The model of conducting research to investigate a specific issue led to the development of a customised training programme which then resulted in training being conducted to a targeted audience. The targeted participants who have attended the skills programme have all concurred how useful and beneficial the training has been in order to build their competencies. In particular, the skills programme provides participants with a holistic and integrated approach and understanding of Human Resource Development. It also helps participants to appreciate the need for better collaboration, cooperation, coordination, communication and capacity of all municipal actors to improve the overall management culture of skills planning and development in South African municipalities. HRD plays a critical role in the workplace and there is a need to ensure that there are healthy HRD practices in the workplace to effect change and support employees, as it impacts on the morale and productivity of the workforce. The ultimate goal is to ensure a healthy, happy and productive workforce. The LGSETA will roll out Phase 3 of the training in the 2019/2020 financial year with the continued focus on building capacity of Management Officials and Training Committee members. The partnership between SPL and LGSETA has shown the benefits of the model which started with conducting research, leading to customised training and with the aim of improving practice and impact in the workplace. As a way forward, it would be most useful to further investigate whether the training has resulted in any changes in the way HRD is practised in municipalities. The monitoring and evaluation of any training programme is important so that the investment in training can be measured in order to determine impact as well as the growth of individuals and the organisation. The impact of such training provide impetus for the LGSETA to see how this model could be used in other areas as well as identify further research on the implementation of the integrated HRD framework in municipalities.